"I would like to take a moment to let you know what a pleasure it is to do busineness with a very professional company like yours. I would also like to make a special mention about your associate Manoj. He handles my account with the greatest of care when I place an order with your business." We purchase all types of converters - ceramics and foils. We offer more than 50 types of converters. If your converter does not fit one of our many categories, we will sample it through our research and expertise to provide you the best price available. In addition to converters, Federal Autocat specializes diesel particulate filters form trucks and buses, as well an ceramic and metallic monolith from industrial and manufacturing emission control devices. For more information on diesel particulate filters and emission control devices please visit our sister company, Recycalytics to learn more. How are we able to the provide the most “Cash” to you? One word: GRADING. Beginning in January 2004, Federal Autocat introduced a new grading program to give our customers maximum value for the precious metal content in this category of converters! Federal Autocat Recycling employs a proprietary (patent pending) process that recovers the full value of Platinum group metals from "metal substrate" or "foil" converters. We will provide our customers with a comprehensive library of converter sizes and types that will enable accurate grading and profitable purchasing of converters in this category. Our proprietary recovery process is clean, efficient and friendly to the environment. A new category means a new profit stream for our customers! Providing pricing that reflects accurate up-to-the-minute market prices for the platinum, palladium and rhodium contained in each converter. Being the "top of the food chain" recyclers. We actually process the material. We do not resell your converters. Developing long term and profitable relationships with our customers. Federal Autocat, a leader in catalytic converter recycling, is now a distributor for Eastern Catalytic. Eastern Catalytic is a market leader in catalytic converters through their world-class quality and innovation. Please view our catalog to find your specific part number. Did you know that platinum mining and production entails extreme energies and massive costs? Extraction, concentration and refining of the metal require quite complex processes that may take up to six months. It is estimated that in order to produce a single ounce of platinum, a volume of 7 to 12 tons of ore must be processed. 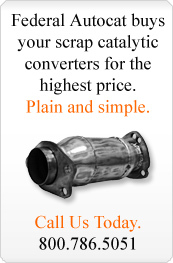 So, in the end, every recycled catalytic converter counts. Our trade-in program lets you do your part and get paid for it! Federal Autocat through its sister company Eastern Catalytic will send you a check for your spent catalytic converter upon the purchase of a new one from Eastern. Upon receipt of your new catalytic converter, enclose the old one into the same packing box with the prepaid postage label we provide. Upon delivery to Eastern, we will grade your returned unit and send you a check in four to six weeks. Soon thereafter we process and refine its PGM and apply them to new converters! For pricing and trade-in questions, please contact Manoj Sathananthan at 800.786.5051, ext 110. Federal Autocat is a distributor for the Northeast of customized lead sheet for our sister company, Mayco. Mayco Inc. is the largest fabricator of lead based products, other than batteries, in the United States. The Company manufactures and sells its lead sheet and other lead products on a nationwide basis to a diverse industrial customer base. MAYCO operates six plants; with the headquarters located in Birmingham, Alabama. As a distributor for Mayco, we will provide you top-notch delivery at the best prices in the Northeast area for sheet lead. For all orders, please call either 800-749-6061 or 205-942-4242 or email [email protected].